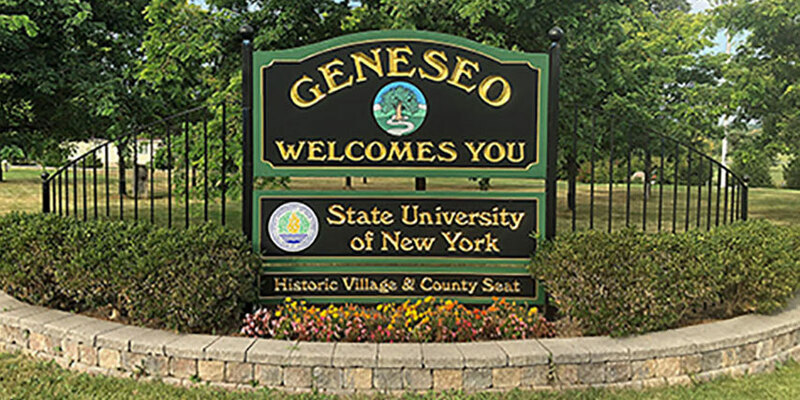 Located near the ancient Seneca Indian meeting place called Big Tree, Geneseo (Seneca for Beautiful Valley) was, and continues to be, an important crossroad where people gather to live and interact in a regional center of family, education and commerce. It is only natural that SUNY Geneseo was established here. It is also natural that business has thrived here through many of our nation's challenging times. People like it here. Geneseo has a growing tourism industry with many fine and varied accommodations. Geneseo is home to the Livingston County Historical Society and the 1941 Historical Aircraft Museum. There are art galleries, restaurants, and wineries. Residents and visitors have access to public parks and open spaces for biking, hiking, historic sights, walking tours, winter fun, and water sports on Conesus Lake and the Genesee River. We believe in Geneseo; good people live here and contribute through a myriad of public and private organizations to bring excellence to the forefront of our experience. Geneseo is a resilient community able to grow with hands firmly fixed on what is great about our past and what is possible for our future. Welcome to Geneseo, a thriving, vibrant community. We are proud of our designation by the National Park Service as a National Historic Landmark, proud to be the home of the nationally recognized State University College at Geneseo, and proud to be the County seat that serves as the site of the Livingston County Government Complex. Combining these resources, Geneseo continues to be the commercial, cultural and recreational center of the County. These attributes, plus a long history of intergovernmental cooperation and civic organizations that coordinate their efforts for the common good, lead to a high quality of life in our community. Geneseo is truly a home!